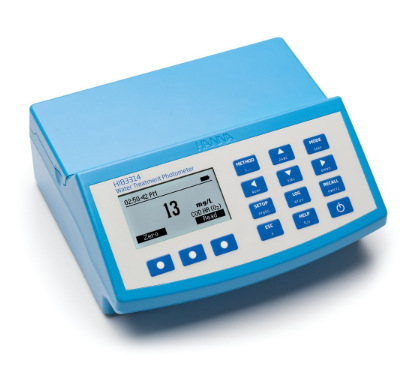 Product information "HI83314-02 Multiparameter Photometer, COD & pH for Waste Water Treatment Analysis"
HI83314 is a compact, multiparameter photometer for measuring key water and wastewater quality parameters. The meter is one of the most advanced photometers available with an innovative optical design that utilizes a reference detector and focusing lens to eliminate errors from changes in the light source and from imperfections in the glass cuvette. 10 key water and wastewater quality parameters with 20 different methods covering multiple ranges are programmed into the meter. Wastewater treatment digestion parameters include COD, Total Nitrogen and Total Phosphorous which are important for monitoring nutrient removal. The HI83314 also offers an absorbance measurement mode for performance verification and for users that would like to develop their own concentration versus absorbance curves. To save valuable laboratory benchtop space, the HI83314 doubles as a professional pH meter with its digital pH/temperature electrode input. Now one meter can be used for both photometric and pH measurements. HI83314 benchtop photometer measures 10 different key wastewater quality parameters using 20 different methods that allow for multiple ranges and variations in chemistry for specific applications. The Chemical Oxygen Demand (COD) parameter is included for industrial and municipal wastewater treatment. The Phosphorous and Nitrogen parameters included are beneficial to municipal wastewater treatment customers that need to monitor their biological and chemical nutrient removal process. This photometer features an innovative optical system that uses LED's, narrow band interference filters, focusing lens and both a silicon photodetector for absorbance measurement and a reference detector to maintain a consistent light source ensures accurate and repeatable photometric readings every time. A digital pH electrode input is provided allowing the user to measure pH by a traditional glass electrode. The digital pH electrode has a built in microchip within the probe that stores all of the calibration information. Having the calibration information stored in the probe allows for hot swapping of pH electrodes without having to recalibrate. All pH measurements are automatically compensated for temperature variations with a built in thermistor located in the tip of the sensing bulb for fast and accurate temperature measurement. The HI83314 offers an absorbance measuring mode that allows for CAL Check standards to be used to validate the performance of the system. The absorbance mode allows the user to select one of the 4 wavelengths of light (420 nm, 466 nm, 525 nm, and 610 nm) to measure and plot their own concentration versus absorbance mode. This is useful for users with their own chemical method and for education to teach the concept of absorbance by using the Beer-Lambert Law. Users can easily select any one of the 20 measurement methods and 4 absorbance methods via the dedicated METHOD button. The HI83314 is supplied with a 16 mm cuvette adapter that accepts digestion vials. Compatible with COD (EPA, ISO, and mercury free methods), Nitrogen and Phosphorous reagetns packaged in 16 mm digestion vial. Reagents are sold separately. A COD reactor is used to heat the digestion vials. The digestion vials must be heated to a specific temperature for a period time making the HI839800 an important accessory required to have a complete wastewater treatment monitoring system. HI83314 is designed with an innovative optical system that incorporates a beam splitter so that light can be used for absorbance readings and for a reference detector. The reference detector monitors the intensity of light and modulates when there is drift due to power fluctuation or the heating of the optical components. Each part has an important role in providing unparalleled performance from a photometer. The narrow band interference filter not only ensure greater wavelength accuracy (± 1 nm) but are extremely efficient. The filters used allow up to 95% of the light from the LED to be transmitted as compared to other filters that are only 75% efficient. The higher efficiency allows for a brighter, stronger light source. The end result is higher measurement stability and less wavelength error. A beam splitter is used as part of the internal reference system of the HI83314 photometer. The reference detector compensates for any drift due to power fluctuations or ambient temperature changes. Now you can rely on a stable source of light between your blank (zero) measurement and sample measurement. The sample cell of the HI83314 fits a round, glass cuvette with a 25 mm path length. Along with the advanced optical components, the larger size of the cuvette greatly reduces errors in rotation from the indexing mark of the cuvettes. The relatively long path length of the sample cuvette allows the light to pass through more of the sample solution, ensuring accurate measurements even in low absorbance samples. HI83314 is supplied with sample cuvettes and caps (4 ea. ), cloth for wiping cuvettes, USB to micro USB cable connector, power adapter and instruction manual. Please note, reagents are not included and can be purchased here. ** Reagents for 50 tests.† Unless noted otherwise, all reagent codes ending with -01 are for 100 tests. *Please note, reagents are not included but can be purchased here. Related links to "HI83314-02 Multiparameter Photometer, COD & pH for Waste Water Treatment Analysis"
Customer evaluation for "HI83314-02 Multiparameter Photometer, COD & pH for Waste Water Treatment Analysis"